Vacation rentals are becoming more and more popular with travelers, especially among millennials. They’re an affordable way to experience a new location without the hassle of booking a hotel room and, more importantly, they give visitors the chance to feel more like locals. Thanks to this booming travel phenomenon, renting out your property can be a quick and easy way for you to make some extra cash. But with all the rental properties now flooding the market, how can you make sure yours stands out from the crowd? Luckily for you, all it takes is a bit of smart strategizing to put your property ahead of most others out there. 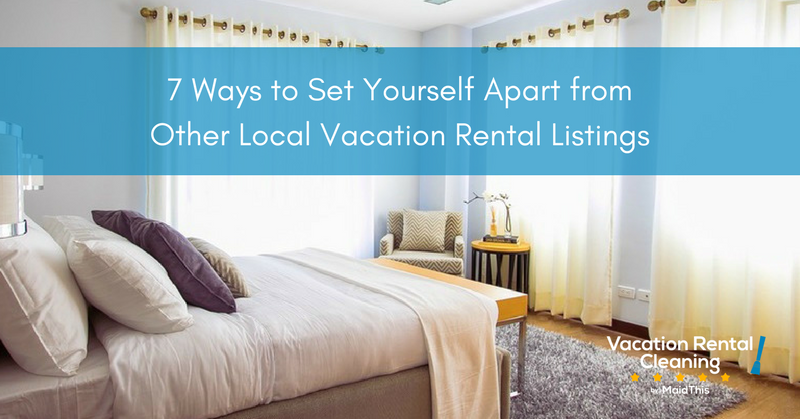 Here are 7 ways you can set yourself apart from other vacation rental listings in your area. 1. Make a great (virtual) first impression. Your listing is all a potential guest has to go on when making a decision about where to rent. No matter how great your property might be, poor photos or bad grammar can put someone off before they’re even finished reading what you have to say. Invest in professional photography for your property and be sure it’s clean and clutter-free. Make a point to highlight any special features the space may have, like a jacuzzi tub or a spacious kitchen, and have someone proofread your listing for any mistakes before you hit publish. In addition, look into having your listing professionally translated into another language (or two!). Spanish has been on the rise in the US for years and these days, it’s not uncommon for things to appear in both English and Spanish. But don’t just stop at Spanish: according to Airbnb, Japanese tourism is on the rise in the US. While it’s not possible (or even logical) to translate your listing into every language, consider what it can do for your bookings. Don’t assume all your guests will be fluent English speakers; do them a favor and expand your reach by offering your listing in multiple languages. Think about what words someone might search for when looking for a property like yours and use those words in your listing. For example, if your space is near the beach, it would be a good idea to use words like “beach house” or “oceanfront” to emphasize that feature. Sprinkle general keywords like these in with more specific ones that pertain to your property, such as “cabin with fireplace” or “villa near LA.” You won’t convince someone who was planning a tropical vacation to stay in your Alaskan-style lodge, but you can capitalize on people searching in your area by being clear about what makes your place special. 3. Be specific about what your property has to offer. While you might think that advertising your listing as “the best” or “perfection” will entice potential renters, hyperboles like those don’t actually tell anyone anything about your property. It’s better to be specific when you’re writing your listing—tell them what specifically sets your rental home apart from other local listings. Instead of insisting that your property has an “amazing kitchen,” highlight the features that make it great: granite countertops, stainless steel appliances, recent renovations—things like that. “Amazing” doesn’t tell a potential guest much about the place, but clear descriptions will stick out and help seal the deal. 4. Establish yourself as a local expert. While your guests might have an itinerary of things they’d like to do during their vacation, chances are they don’t know much about the area. You have the opportunity to wow them with your knowledge of local hot spots and potentially help take their trip to the next level. Put together a brochure of your favorite things to do around town: places to eat, attractions to see, whatever you think is worth checking out. If designing a brochure doesn’t sound like something you can do, you could collect some from your city’s tourism office and leave them on the counter for your guests to use. Let them know they can reach out to you with any questions they might have. If you’re not originally from the area and don’t know much about it (or if you’re a host who doesn’t live near your vacation rental), that’s okay. A simple Internet search will give you the answers you need—you’ll still be saving your guests the trouble and that’s the whole point. 5. Offer the latest technology. This point might be limited by your budget, but if you can, try to provide the latest technology for your guests to use during their stay. This could include offering gaming systems, fancy kitchen equipment, big TVs, sound systems… you name it. If your guests have these things at home, they’ll be grateful to have them on vacation, too. However, it’s also possible that these things will be an upgrade from what they’re used to. They’ll have the chance to try out some amenities that other properties might not have, which will make their stay that much more comfortable. 6. Don’t just advertise: tell a story. While you want to highlight your property’s features in your listing, you’re not just trying to sell your home: you’re selling an experience. You want potential guests to be able to picture themselves enjoying a vacation in your rental. When writing your listing, don’t just list out the basics. Be descriptive: instead of saying, “Hot tub in master bathroom,” say something like, “Relax in the master bathroom’s luxurious hot tub after a long day of exploring.” By focusing on what your guests can do at your property instead of just what the place has to offer, you’ll fill in the gaps for them and allow them to imagine themselves in your vacation rental as opposed to others. 7. Go above and beyond. Your guests might be choosing to stay in your space rather than going to a hotel, but you can still think like a hotel in order to make their stay extra memorable. What little things do hotels do to make their guests’ stays feel luxurious? Little touches like leaving chocolates on bed pillows, arranging fresh flowers in vases around the house, and providing travel-sized toiletries will show you care and are willing to go the extra mile to make sure your visitors have a memorable experience. In the end, ensuring your rental stands out from the crowd really comes down to putting your guests first. Think about ways to make their experience a good one—from the moment they view your listing until the day they leave. It will pay off exponentially and you’ll be more likely to have repeat guests and stellar reviews. Of course, the best way to set your vacation rental apart is to make sure it’s been professionally cleaned by the time your guests arrive. Learn more about our vacation rental cleaning services.